Sweet Lambie B is perfect in every way. By virtue of her neutral coat, she makes an ideal choice for any nursery. 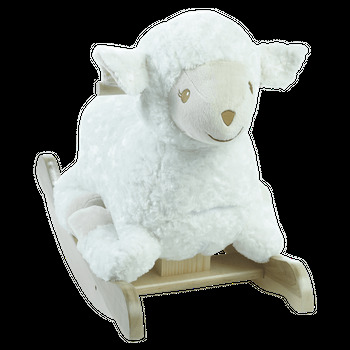 Lambie B is a gender-neutral gift for both little boys and girls for those times mom and dad choose to keep gender a secret. She's not one to brag, but she has some fabulous surprises for her riders as well - hidden squeakers and crinkles - plus she comes equipped with several educational and fun songs. To play a song, Lambie B's rider just pushes 1 of 4 buttons on the back of her woolly head, activating original songs that teach ABC�s, 123's, colors and more. American maple hardwood throughout... including a maple base, easy grip maple handles and the softest fabrics from around the world. Made in the USA: All wood products, stuffing, production, assembly, and packaging. Fabric shells and music boxes are from overseas.